This dish is a tale of two Italys. On the left, broccoli rabe sauteed with anchovy, garlic, red pepper, and lemon. 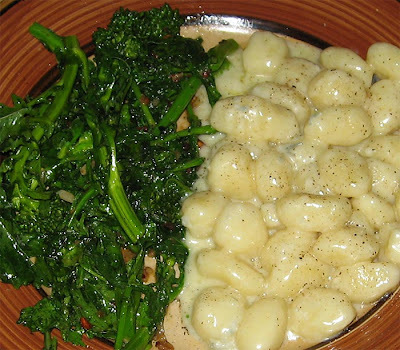 On the right, gnocchi in a gorgonzola sauce. One would be well at home in Naples, the other Turin. This dish demonstrates how both the north and south of Italy have forceful, intense flavors at hand. The rabe is briney and fiery. The gnocchi is pungent and sharp. 1. Sautee anchovy fillets in olive oil until tender, then mash with back of fork and mix into the oil until it forms a paste. 2. Add garlic, some more olive oil, and sautee till golden. 3. Add red chili pepper flakes, let sautee in the oil for 30 seconds. 4. Add broccoli rabe, sautee on medium heat until wilted. Coat well with the rest of the ingredients. 5. When plating the rabe, squeeze a bit of lemon juice over the top. Very simple. Take a tablespoon of butter and a tbsp of olive oil, melt together in a sautee pan on medium-low heat. Add hunks of gorgonzola (I used total around 3 oz, adjust to taste) and let melt. Do not let simmer too rapidly. In a separate pot, boil gnocchi till they float to surface. Remove quickly and place immediately in the gorgonzola sauce. Combine and serve with fresh black pepper.